(Museum of Appalachia press release) Orton Caswell Walker (1902-1998) wore many hats, including grocery store magnate, politician, and of course, bluegrass and country music promoter. Early on, Walker understood the value of using country music to sell groceries, buying up air time on local radio, and later making the switch to television. Walker’s popular programs could be seen and heard over the local airwaves from 1929 until the early 1980s. 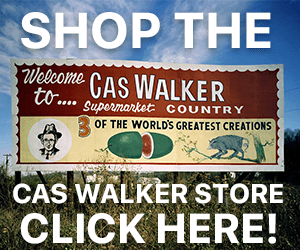 On Saturday, March 2nd, the Museum of Appalachia will host a celebration of the legendary Cas Walker. Titled Now Let’s Have Some Pickin’ and Singin’: Cas Walker’s Legacy, the show, spearheaded by archivist Bradley Reeves, will be from 4 to 6 pm and include a special screening of surviving video clips from the Farm and Home Show, including classic commercials, vintage music performances, and hilarious bloopers and outtakes! Tickets to the event include admission to the Museum of Appalachia’s Hall of Fame, featuring the Cas Walker Exhibit, with artifacts from his early career. Preview begins at 3:00 pm .